The show was a good one, though it surprised me by not being as large as say the Frankfurt Show. The cars that got the most attention include of course the Nissan GT-R PROTO, along with Audi's Shooting Brake concept and its surprising new V10-engined S8 super-saloon. Take a look through the galleries and news below. We are taking our first trip to the Tokyo Motor Show this year. Not all exhibits are relevant to the European market, but there promises to be some very interesting new machinery, and some weird and wonderful concepts too. The show itself runs from October 22nd to November 6th. 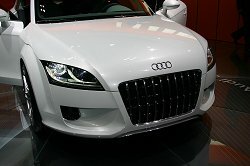 The official show website is www.tokyo-motorshow.com. Audi's V10-engined S8 super-saloon surprised us in Tokyo. Here's our image gallery. Audi revealed the V10-engined S8 in Tokyo, hiding a Lamborghini engine under its sober body. The Audi Shooting Brake was one of the most photographed cars at the Tokyo Show. Click on the image to view our gallery of photographs. Audi will reveal the promising Shooting Brake concept in Tokyo next week. It could be made. BMW brought the gorgeous Z4 Coupe concept from Frankfurt to the Tokyo Show, and the recent announcement of an M Roadster strengthens this car's chance of making production. Click on the image to view our gallery of photographs. What we saw as the D-Compact in Frankfurt has been renamed the Be-go for the Japanese market and was shown at the Tokyo Show. It is likely to replace the Terios. Click on the photo to view the image gallery. Daihatsu had plenty of concepts at the Tokyo Show. The Costa has nothing to do with a well known coffee chain, but is a little bit frothy. Click on the photo to view the image gallery. Another green (in colour anyway) concept on the Daihatsu stand in Tokyo was the SK Tourer, previewing a new Japan-only small car with big car aspirations... Click on the photo to view the image gallery. Daihatsu continued its line of ultra efficient concept cars with the UFE-III shown in Tokyo. Click on the photo to view the image gallery. As a 50th birthday present to Giugiaro, Italdesign designed the Ferrari GG50. It was displayed at the Tokyo Motor Show, then the 2006 Detroit Motor Show. Ford unveiled the Equator concept in Tokyo, a compact SUV designed to be sporty to drive. Click on the photo to view the image gallery. Honda's trio of concept cars at the Tokyo Show included the fuel cell powered FCX research and development car. Click on the photo to view the image gallery. The Sports 4 concept from Honda, shown at the Tokyo Show is a four-door, four-wheel drive, sports saloon. Click on the photo to view the image gallery. Honda's W.O.W concept seemed to be a car designed for people with an unnatural love of dogs. It did however include some interesting storage solutions and kept the crowds entertained in Tokyo. Click on the photo to view the image gallery. Hyundai showed us how it's thinking with regards to future large SUVs with the sleek Neos-3 concept car in Tokyo. Click on the photo to view the image gallery. The next Lexus LS saloon broke cover in the form of the LF-Sh hybrid concept shown in Tokyo. Click on the photo to view the image gallery. Mazda's Senku concept shown at the Tokyo Show looks good, but is surely just a flight of designer fancy? Click on the photo to view the image gallery. The Senku concept car debuts in Tokyo next week, previewing future Mazda coupe design. The Mini Concept Tokyo wasn't nice, but shows the way to the next Mini, and a Traveller version. Another world debut at the Tokyo Show this month will be Mitsubishi's new Outlander SUV. Mitsubishi will show the Concept D:5 in Tokyo, a performance minivan not likely to come to the UK. It won't come to the UK officially, but the Lancer Evo Wagon looks like a lot of fun! It will be shown at the Tokyo Motor Show. 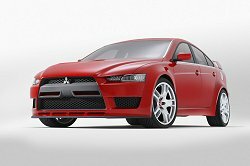 The Evo X is promised to be a radical departure from the norm for Mitsubishi. In Tokyo we will see its preview, the Concept-X. Curvy Nissan concept takes a leaf out of Italian book of car design with its Foria concept shown at the Tokyo Show. Nissan's GT-R concept car drew the biggest crowd at this year's Tokyo Motor Show, a thinly disguised preview to the eagerly awaited new Skyline. Click on the image to access the full gallery of images. These are the first sketches of the Nissan GT-R PROTO, previewing the Skyline replacement. The concept car will be shown at the Tokyo Motor Show. Subaru will show the B5-TPH concept in Tokyo, a performance hybrid. The Ionis was one of many concept cars on the Suzuki stand at this year's Tokyo Motor Show. 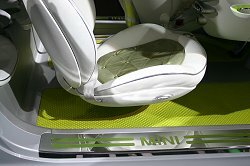 It is a three-seat city car with a sliding central front seat. Click on the image to access the full gallery of images. Suzuki shows off four new concept cars at next week's Tokyo Motor Show. We'll be there. VW's Polo GTi will make its debut at the Tokyo Motor Show this month, looking like a miniature Golf GTi.